A privately held company that invests in, acquires, incubates, and operates media and entertainment companies. In their search for a better source of daily vitamins, Activate’s founders made a discovery that demanded attention. At first, it seemed like nothing more than an intriguing gimmick – a cap that featured a moisture-resistant compartment inside where ingredients could be stored and released before drinking. But as they began to research the benefits of keeping the active ingredients separate from the water, they realized the key was hidden inside this innovative cap. According to research conducted in partnership with an independent analytical laboratory, vitamins and other ingredients lose their potency sitting in water. By storing the active ingredients inside the unique cap, separate from the water, the ingredients stay powerful, fresh and offer a convenient, all-in-one delivery method. 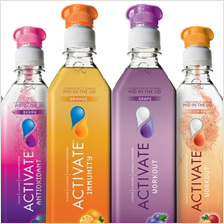 And thus Activate was born – naturally sweetened with Stevia, with only 5 calories per bottle, no preservatives, surprising flavor and fresh ingredients delivered with a twist. Founded in 1938, Topps is a leading creator and marketer of trading cards, distinctive confectionery, and entertainment products. Topps card products cover sports such as Major League Baseball, NFL, Premiere League, Bundesliga, and the Indian Premiere League as well as entertainment properties such as Disney, WWE, and Star Wars. The Company's confectionery brands include Bazooka bubble gum, Ring Pop, Push Pop, Baby Bottle Pop and Juicy Drop Pop lollipops.